Honeybees are an integral part of the agricultural industry, especially in the Midwestern United States. Honeybees serve as pollinators of crops, an invaluable job of honeybees, as well as producers of honey. Diseases that kill members of the colony threaten honeybee colonies, typically only partially treatable with pesticides. Hygienic behavior, meaning the bees clean out diseased brood from the hive, confers a natural resistance to three diseases of bees: American foulbrood, chalkbrood, and varroa mite. However, it is not found in all colonies and only a certain number of honeybees contain this behavior in a given colony. This desirable behavior can be traced to genetics—meaning hygienic honeybees exhibit this behavior partly due to information they carry in their DNA (genetic material). We are undertaking a large genetic screen in cooperation with Dr. Marla Spivak of the Entomology department at the University of Minnesota. To isolate specific genes, we will look for differences between genes used in brains from hygienic honeybees vs. non- hygienic honeybees. The brains must be dissected and the appropriate genetic material (RNA) isolated for comparison. This comparison between the RNA of hygienic and non-hygienic bees will be done at the genomics facility at the University of Illinois. Chopp, Laura. "Isolating Brain RNA to Determine Genes Involved in Hygienic Behavior in the Honey Bee, Apis Mellifera." 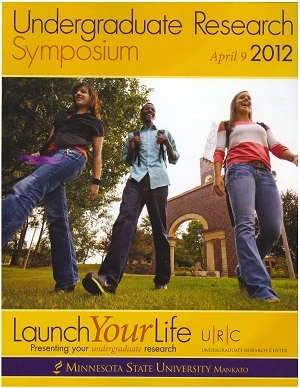 Undergraduate Research Symposium, Mankato, MN, April 9, 2012.